Here are 9 flash tips that may help introduce your child to the flash on a camera. Think of how a flash might look to them from their point of view. Camera flashes can "traumatize" a child early on. Your child may already duck or flinch when you pick up your camera. Does he or she automatically close their eyes when you say "watch the birdie?" The damage may have been done and you haven't noticed. (Did you just get a "flash" of insight?) Let's throw this simple subject out for discussion. Make it fun to smile for the camera by preparing them for the flash or making a game between kids and the flash on a camera. 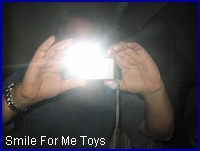 Tip #1 - Break them in slowly with camera flash "games". You can snap a photo off to the side of an infant (and delete the photo later) and see how they react. Determine their agitation level before you snap their photo straight on. You might just consider day shots with lots of natural light near windows if they are reacting too negatively and turn off the flash and let the camera compensate for lower lighting. Tip # 2 - Take older infants or toddlers into the room where you will be taking their photo and have them play with the room lights with you. Hold them up to the light switch and make a game of flipping on and off the room's lights. Get them to laugh during the "on" times with a kind of "peek-a-boo" feel and limit any dark time that might scare them too much. Have someone take a photo of you both being silly together. Tip #3 - Brainstorm about your child's interests. Any Power Ranger or Transformer fans that see "shazaam" type flashes on their favorite shows everyday? Yell "bang" or "zap" and see what their reactions are. "Phasers on stun" would be a bit outdated, but you get the idea. Tip #4 - Encourage attitudes in budding stars. Glitz and glamour, songs and dance show trends in today's entertainment cycles might have captured your child's interest. They may be be less afraid of the flash and be very comfortable with the bright lights concept. Have them act as if they are their favorite star and they'll eat up the attention a flash may cause at that point. Tip #5 - Have them turn the camera and flash on you! Show them that you don't mind the camera being flashed at you (or at least fake it well) and show that it makes you laugh and smile big for the camera. Tip #6 - Do not use "red eye" reduction modes. They are confusing for kids and adults alike. It's that setting on your camera that makes a strobe effect flash that is designed to get your subject's pupils a bit more constricted to reduce red eyes in photos. Have your subject look slightly off camera or look up at a birdie or turn on more lights around them and use the normal flash. If you do favor the "red eye" flash, (or if your camera automatically does it), let your subjects know about the "disco" effect so they will be prepared. Tip #7 - After snapping a shot of a group of family or friends, yell "hold it, don't anybody move!" Take a second to review your photo to make sure no one blinked. You might have a keepsake on your hands and you can fix it with five more seconds of patience from all parties. Tip #8 - Do not OVERDO it. Remember, you don't have to take a photo of every gift or capture EVERY moment at parties. Avoid stopping the fun by constantly telling someone to pose for a camera shot. "Wait, hold up that present again" will have kids of most ages resenting a camera in a hurry and perhaps with lasting results. Finally, Tip #9 - If you have the flash off, let your child know so they can learn what to expect. Try asking them to decide whether they want it on or left off. (If their age is appropriate, it puts them in control.) It is our sincere wish that these camera flash tips will help you to reduce any fear or anxiety in your little one and help to create a fun atmosphere and to make it count when your camera is out.